They survived Carmageddon, but now Los Angeles is coping with the sequel! Once again, the famous 405 freeway has been shut down, forcing Los Angeles drivers off the road. NBC News' Diana Alvear shows us how Angelenos are using this weekend to embrace car-free adventures. Updated at 1:58 p.m. ET: Carmageddon II, the sequel to last year's shutdown of one of the nation's busiest freeways, appeared early Sunday to be going according to script as many Los Angeles drivers heeded warnings to stay off the road. The small exception were the seven people who trespassed -- including newlyweds who sneaked onto the closed portion of I-405. They were immediately detained by the California Highway Patrol. "Now they have two documents with their names on them," Los Angeles Police Department Lt. Andy Neiman said. "A marriage certificate and a citation from the California Highway Patrol." Four rollerbladers were also caught; they were on their way off the highway. Traffic tie-ups were minimal Saturday as construction crews worked around the clock to tear down a portion of the Mulholland Drive bridge on Interstate 405 as part of a $1 billion project to add a new carpool lane. Officials said the demolition was on schedule and that they expect to reopen the freeway as planned for 5 a.m. local time (8 a.m. ET) Monday. For the most part, drivers steered clear from the freeway. As temperatures climbed into the 90s, those who couldn't resist a trip to the beach said traffic was smooth. "We've been all over the city, no traffic. We even went to Dairy Queen for an ice cream and there was nobody there," Marilyn Millen told KNBC-TV. For weeks, Angelenos have been warned to avoid the area on L.A.'s West Side. If they don't, officials warn, a citywide traffic jam could result. But beyond just scare tactics, city officials have been encouraging Southern Californians to get out and enjoy their own neighborhoods on foot, on bikes or via short drives on surface streets. During a similar closure last year commuters stayed away from the freeway in droves, the shutdown was considered a success, and crews finished the first phase of the work early. This time, the contractor faces a penalty if the work isn't done in 53 hours. The fine is $6,000 per lane of freeway, for every 10 minutes over the deadline. 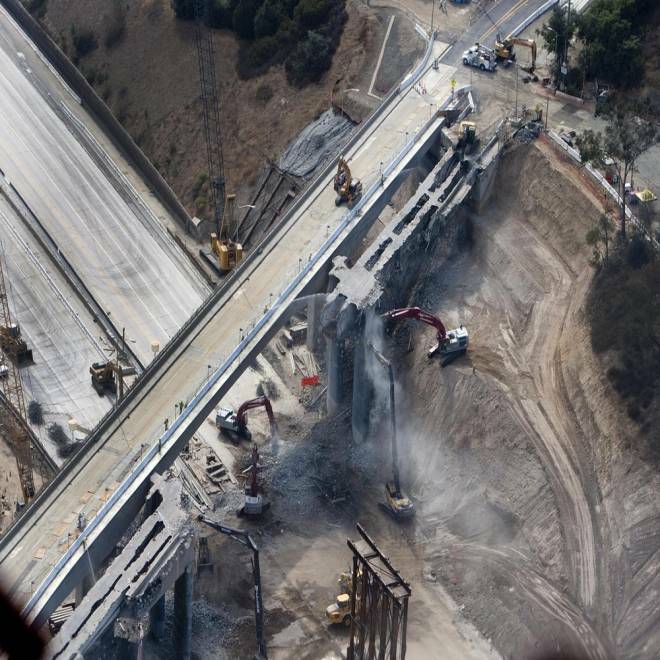 Construction crews demolish the north side of the Mulholland Bridge over the closed 405 freeway in Los Angeles, California, Saturday. Officials on Saturday night told NBCLosAngeles.com that the work should be finished by the completion deadline. However, workers however hit a snag just after 4 p.m. PT Saturday (7 p.m. ET) when a big chunk of the bridge gave way, collapsing onto a hillside while still attached to a large support column. The work was temporarily halted for a short time while engineers could check out the fallen section. No one was injured in the collapse and the bridge demolition later resumed. Dave Sotero, a spokesman for Metro, the agency overseeing the project, said that it was not clear what caused the large chunk of the bridge to fall. The chunk fell from the eastern span of the bridge onto the slope leading down to the edge of the freeway. The closed section of the freeway carries about 500,000 motorists each day on a typical weekend, according to the Los Angeles Times. California Department of Transportation officials said that in order for Carmageddon II to be a success, at least two-thirds of those drivers need to stay off the road.